Judy is a tremendous business thought leader, author, speaker, angel investor and entrepreneur. She has been known as “the woman with the titanium digital Rolodex.” Judy has an impressive list of connections and credentials, and she credits her ability to make such powerful connections with the philosophies and strategies she writes about in her book, How to Be a Power Connector: The 5+50+100 Rule for Turning Your Business Network into Profits. To read the list of her career accomplishments, please check out her website’s about page and resources listed below. The most important point, however, is this: Judy was incredibly shy as a kid and was bullied in junior high. Not only that, even in her adult life, she would hide in the corner of corporate events. 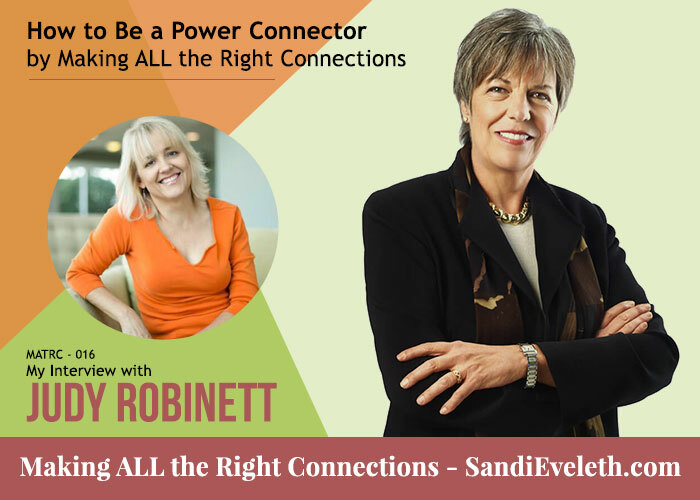 So, how did Judy become one of the most powerful “Super Connectors” in the world? By utilizing many simple, yet brilliant networking strategies. I had originally learned about Judy when I Googled the words “how to become a power connector” as research for my new membership site. Needless to say, not only was she the ONLY person named on the entire first page of Google (out of 2.1 million results, may I add! ), but she was also the only person referenced on the second page and almost the entire third page. Her book also caught my eye and, of course, I had to buy it. 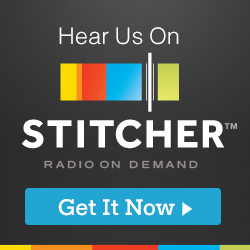 Then I realized Judy just HAD to be on my podcast! Utilizing some of the strategies she mentions in her own book, I decided to reach out to someone that knew her. That someone happens to be Martin Shervington, whom I just interviewed previously! Without hesitation, Martin introduced us via email and Judy graciously agreed to be on my show. Thank you, Martin. Judy incorporates in her book, coaching, and speaking exactly what I have coached others on for years, but in much greater depth and breadth. She embodies the best strategies and philosophies for Making ALL the Right Connections. You never know whom you may be sitting next to in a coffee shop, a bookstore, a plane, in line at the grocery store or anywhere else! Have no fear and talk to strangers. Most people are kind. You have to say hello and you have to learn to ask questions. Have a philosophy of wanting to solve others’ problems. Every resource you need is within your reach. We only talk to strangers 2-3% of the time. Your best connections are those that are more a friend of a friend of a friend (not your immediate friends and family). Start looking for more powerful organizations to meet new connections – most people just keep going to the same network meetings that don’t foster any meaningful connections. Ninety percent of network meetings are a waste of time. 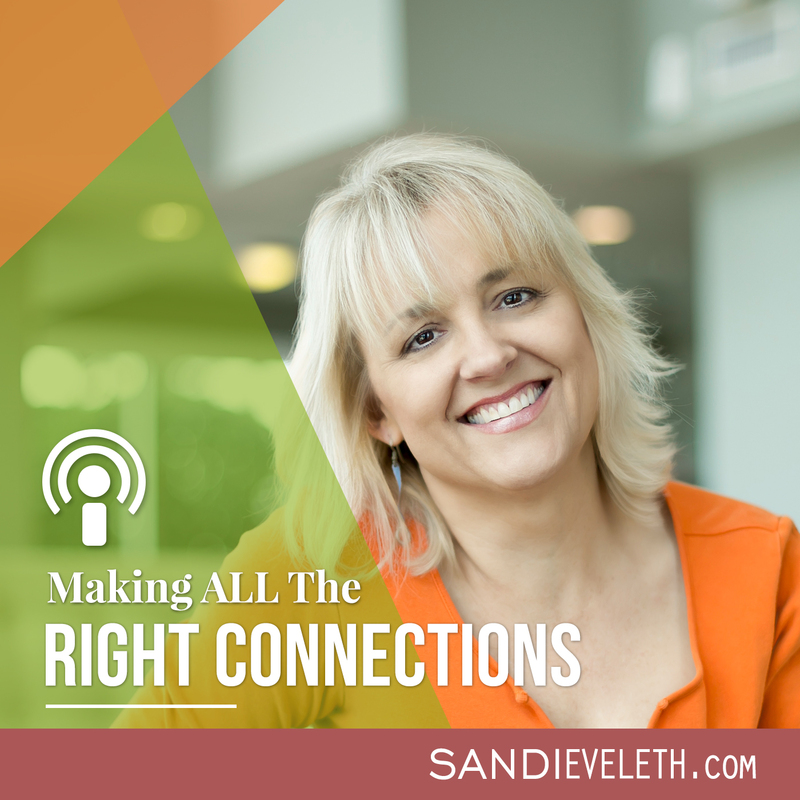 Judy’s criteria for making the right connection for her are people that have a good head, a good heart and a good gut! Your Network = Your Net Worth: Have a diverse, robust deep network to grow your net worth. What other ideas do you have for me? Who else do you know I should talk to? If you just start sharing your story, you will be surprised at what opportunities may show themselves – get out of your comfort zone and find more powerful groups that have individuals who: are competent, have warmth, will help you, have your back and your future, have influence and gravitas (dignity, seriousness, or solemnity of manner). write down the people you know and pay special attention to the second tier of 25-50 people (listen to the podcast to know who these people are) you know – if you have quality relationships that are across different industries, and with influential people, you can literally make anything happen with these 25-50 people. Strategically target the people you would like to connect to and take action towards them. Add value (see the next point) to these connections. You can join some of the prestigious clubs in New York City without living there or without having graduated from those colleges or universities. Judy’s HIGHLY RECOMMENDED book, How to Be a Power Connector: The 5+50+100 Rule for Turning Your Business Network into Profits , is by far one of the best books I have ever read on the topic of making all the right connections. You can read the book review by clicking here. Dale Carnegie’s How to Win Friends & Influence People . Stephen Covey’s The 7 Habits of Highly Effective People: Powerful Lessons in Personal Change . The Alley to the Valley Organization. The Association for Corporate Growth.